Tomorrow's Times has an obituary of Xavier-Léon Dufour who died on 13 November, aged 95. Xavier-Léon Dufour was one of the greatest liberal Bible scholars of the 20th century. As such, he often found himself at odds with the conservative Catholic hierarchy, not least with Pope Pius XII himself. Using historical and critical scholarship to challenge more fundamentalist approaches to the Bible was not, he insisted, to deny the divine element in the origin of Scripture. But the text as we have it today was written by men at specific periods of history.And a critical study of both the men and the history, Dufour maintained with passion, was vital to an understanding of the sacred text. The new scholarship which had its origin in the work of 19th-century German Protestant scholars, met resistance both from the Catholic hierarchy and from parts of the Protestant establishment. Dufour himself was accused of seeking to deprive priests of their faith . . . This was the first I had heard of Dufour's death (but I now notice that it was announced in Bibbiablog a few weeks ago). I never met him but one of my great influences, John Ashton, was taught by him and often used to sing his praises. The story of Jesus imagined through the eyes of those who witnessed it. Peter and his brother Andrew tell the story of how Jesus was baptised and began to teach in Galilee, and how they were inspired to leave their lives as fishermen and follow Him. I am listening at the moment. It has a very Man Born to be King feel to it, and is great listening, though the accents are more obviously regional than they were for the Dorothy Sayers classic. I hope to continue to comment as the week goes on. I will post periodic reminders about listening to it. It's actual broadcast time is 2.15pm daily. Ernie Rea presents a series exploring Luke's gospel. 1/5: He looks at the social and political context of Jesus's radical teaching on the Kingdom of God. Over on Bible Films Blog Matt Page comments on my recent posts on Paul of Tarsus and Jesus of Nazareth. He mentions a comment on his earlier post from a certain WitlessD who has done a little more research on the series and confirms the episode titles I set out. S/he also confirms the location, "Filmed in Aghios Nikolaus, Crete, and at Ealing Studios". Despite the appearance of Gnostic "gospels," the early church decided that Matthew, Mark, Luke, and John were without rival. Historically speaking, those touting the apostolic origins of the apocryphal gospels had little to stand on. These texts came much later than the four-fold gospel collection. The canonical gospels were all first-century documents; all four offer credible eyewitness accounts of Jesus of Nazareth. The apocryphal gospels, written generations later, can barely compete with this claim. This drives too strong a wedge between "canonical gospels" and "apocryphal gospels". We may not be talking about "generations"; that sounds a bit like overstatement. In contemporary New Testament scholarship, the idea that "all four offer credible eyewitness accounts" is a highly dubious claim, and one that should not be made with so little qualification. It is true that there is now a case that the canonical gospels are reliant on eyewitness testimony (Richard Bauckham) but as far as recent New Testament scholarship is concerned, this is a new and highly controversial claim that is only now beginning to be tested, and even Bauckham does not claim that the four are written by eyewitnesses (except perhaps John). So, have you ever seen the TV series Jesus of Nazareth? No, not that series, but the one made twenty years earlier by the BBC? Me neither. In fact I didn't even know about it until yesterday. Here's the story. The idea for this book and the Television series that preceded it was born in 1956 when the series 'Jesus of Nazareth' ended with these words from Jesus to his disciples: 'Go and teach all nations the things that you have seen and heard . . . . . And know that I am with you always -- even unto the end of the world.' It left one with the feeling 'What happened then?' After all, it was a big order to give a handful of fishermen and peasants in a small occupied country . . .
And so on. 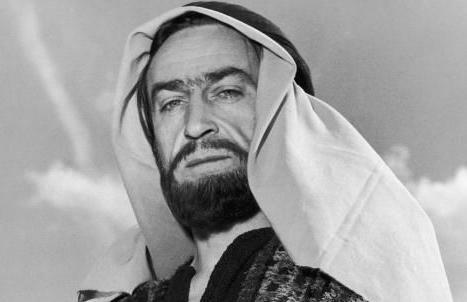 So, it seems, there was a TV series on Jesus' life broadcast in 1956 on the BBC. I didn't think I had heard of this before, so I went to the net to see how many others had heard of it. The answer is: very few. But perhaps what is considered her most notable work for television was the eight-part Sunday serial Jesus of Nazareth (BBC, 1956) for which she received the 1956 award of the Guild of Television Producers and Directors (now BAFTA), the first to be presented for a children's serial. A live studio production with exteriors filmed on location in Galilee and Jerusalem, it was a courageous undertaking. At that time, censorship regulations prohibited the portrayal of Christ by an actor in public performances. However, the Central Religious Council approved the project and Tom Fleming was cast as Jesus Christ. The serial was an outstanding success. Harington followed with a similar ten-part series, Paul of Tarsus (BBC, 1960), for which the exteriors were filmed mainly in Crete. So we now know that Paul of Tarsus was filmed in Crete, and Jesus of Nazareth was partly filmed in Israel, and the latter was considered "a children's serial". There is more research to be done about this lost series, and I look forward to reporting back on this in due course. Joy Harington was inspired to create this life of St. Paul, which she herself calls 'a chapter in the history of man's search for God'. Paul of Tarsus traces the growth of Christianity from the upper room in Jerusalem, through the disciples' fearless witness for the risen Christ; Saul's sudden conversion on the road to Damascus; his establishment of the early churches in Asia and Greece; his shipwrecks and torments, until, as a prisoner in bonds, he reaches his heart's desire -- Rome. This book is profusely illustrated with photographs, some coloured, many taken on location in the Mediterranean countries for the BBC Television production in the autumn of 1960. Enthusiastically welcomed by church leaders everywhere. So we discover that there was some location shooting, in the frustratingly vague term "Mediterranean countries"! And the date of first broadcast is confirmed as the autumn of 1960. The photographs, though, are the highlights of the book. One of the black and white pictures shows Eutychus asleep in the window. Another shows "Paul and Barnabas rejected from Iconium" in what is clearly an original location and not a film set. Indeed, Barnabas appears to be something of a co-star and appears in many of the pictures. The text itself is not especially interesting except in giving an idea of how the series itself must have worked out. It is a retelling of the Acts narrative with insertions from Paul's letters, and other insertions from the imagination (e.g. Paul gets malaria in Troas, p. 129). In fact, it appears to be quite Acts heavy, e.g. the break from Barnabas is the Acts-based argument over John Mark (p. 129) rather than the Galatians-based argument about eating with Gentiles. Since the two episodes that are listed by BFI are entitled To the Gentiles and The Feast of Pentecost, it looks like these chapter titles are indeed the episode titles. At Paul's dictation Luke wrote many letters to cheer and strengthen them. One of these letters was to his 'beloved son' Timothy . . .
. . . . In his lodgings in Rome Paul stood, chained now by his wrist to a ring in the wall, looking out of the window at the great city of Rome with its statues and noble buildings. Luke sat on the ground near him, his pens and scrolls around him, ready if Paul should wish to send another letter of comfort and encouragement to one of the churches. Only Luke was with him now . . . .
And that's how the book ends (with the ". . ."). I was privileged to be associated with Joy Harington in the early days when she was preparing for the writing of the scripts. I know how much time and thought she gave not only to the biblical record in The Acts and the Epistles but also to the social, political, and religious background of the age. the results of that careful study are apparent in the scripts she has written. Joy Harington has been faithful to the story in the Bible, and she has kept close to its spirit. One of the many good things she has done is the incorporation of passages from St Paul's Letters in their appropriate place in the story. Those who watched this story on BBC Television will be glad to have it in book form. Those who did not see it, having read the book, will be waiting eagerly for the series to be repeated . . . It is interesting to see not only that this foreword describes the book as "scripts", which suggests that the prose narrative is closely adapted from the scripts, but also that it speaks about repeats, which means that it cannot have been wiped, at least not in the early 60s, and so we can be hopeful that it survives somewhere (e.g. at the BFI, where I will plan a research visit one of these days!). Joy Harington also has an interesting "Author's Note" at the beginning of this book, and it reveals something else of great interest, and that will be the subject of a separate blog post later. A survey found 27 per cent of Britons aged 18 and over were unable to identify Bethlehem as Jesus's birth place, while the figure rose to 36 per cent of people aged between 18 and 24. One in ten of those questioned thought the answer was Nazareth and a similar number said Jerusalem. The poll also found that more than one in four people - 27 per cent - were unaware that an angel told Mary that she would give birth to a son, with some saying she was informed by the shepherds. Most people surveyed believed that Joseph, Mary and Jesus fled to Nazareth rather than Egypt when they escaped from King Herod, and a few even said the holy family's destination was Rome. The survey also revealed that just over half did not know that John the Baptist was Jesus's cousin . . . It's a regular feature around this time of year to have a survey like this. A couple of year's ago, The Times attempted to trick clergy into providing wrong answers to questions too in order to grab a headline. The article pulls a classic stunt in the presentation of dull statistics and instead of drawing attention to the bland but relevant fact that according to its survey, the vast majority answered the key question correctly, it focuses instead on the 27% figure who did not. So the headline becomes "Britons who don't know where Jesus was born" rather than "the vast majority of Britons know where Jesus was born". There are other problems too. It is true that Elizabeth is described as Mary's kinswoman (συγγενίς, Luke 1.36), but it may be a little too specific to talk about John the Baptist as Jesus's "cousin", and this is a detail that is distinctive in Luke. I don't think that it is shocking that "just over half did not know that John the Baptist was Jesus's cousin". Rather, it's impressive that so many know this (possible) minor detail in Luke's account. And it is worse. Look at how the question is framed, "3. Who was Jesus' cousin?" This is not the right way to frame a question if you are trying to find out whether people are aware of a possible relationship between Jesus and John the Baptist. I think the 26% who said that they did not know might have been on the ball here. And the 6% who said "James" may also have been right, at least if they were following Jerome. 4. Where did Joseph, Mary and Jesus go to escape from King Herod when Jesus was a young child? 22 per cent correctly said Egypt. Of the 78 per cent who were wrong, 52 per cent said Nazareth, five per cent said Babylon and one per cent said Rome. The correct answer is, of course, Egypt (Matt. 2.14). But Nazareth is not so daft an answer, since it is where the family had arrived by the end of Matthew's story (Matt. 2.23) and they were going there to escape another Herod, Archelaus. True, Archelaus was an ethnarch and not a king, but then Mark calls Herod the Tetrarch (Antipas) a king too (Mark 6.14), so if some of the British punters in this survey got their Herods mixed up, who can blame them? In other words, this piece is a fine example of how to turn a not-very-well-worded survey into a news story. Wikipedia founder Jimmy Wales has said teachers who refuse students access to the site are "bad educators". Speaking at the Online Information conference at London's Olympia, he dismissed the long-running controversy over the site's authority. He said he now thinks that students should be able to cite the online encyclopaedia in their work . . . .
. . . . Since the controversy, in which it emerged that the "free editing" policy had allowed articles containing inaccuracies and bias to appear, the site has introduced a system of real-time peer review, in which volunteers check new and updated articles for accuracy and impartiality. Despite advances in technology, there are no plans to automate this process. "There is no substitute for peer critique," Mr Wales told delegates. As I have mentioned in previous discussions of the issue here, I am not in favour of citing Wikipedia as an "authority", if by this we mean using it as a means of establishing points without any further discussion. I encourage my students, who are preparing for examinations at the moment, to engage critically with a range of secondary sources, one of which may indeed sometimes be Wikipedia. April DeConick's Gospel Truth, published in The New York Times earlier this week is a model of how to write a clear, informative op-ed piece on a controversial academic subject. It is no surprise, as the T and T Clark Blog mentions today, that it is "causing something of a stir in the blog world". The backlash begins today, though, with robust responses from Marvin Meyer and Terry Garcia in letters to the New York Times, The Gospel of Judas: A Word from the Translators. On Metacatholic, Doug Chaplin has a great little unofficial Biblical Studies Carnivalette, which just goes to show that non-canonical texts can be as interesting as canonical ones. I posed a trivia question yesterday, "Which of the ten doctors also played the apostle Paul?" Some of the suggestions in comments were amusing, including Eric Idle (who played neither) and Anthony Hopkins (who played Paul but not the Doctor). The correct answer is Patrick Troughton (1920-1987), the second doctor (1966-9), who played the tile role in Paul of Tarsus, a BBC series which broadcast in 1960. Until yesterday, I head never heard of this production, but I was listening to the latest episode of Doctor Who Podshock (Ep. 96), which featured an archive interview from 1986 with Patrick Troughton. He mentioned Paul of Tarsus as one of the things he was most proud of. The production has relatively little internet presence. It has no IMDb page, for example, and no Wikipedia entry. It has never been released on video or DVD. Indeed, it is not even clear to me whether it still exists. A lot of the BBC productions from that era, including many of Troughton's own Doctor Who episodes, were wiped. A cycle of ten plays telling the story of the Acts of Christ's Apostles. BBC tx 1960/10/16 - 1960/12/18 (Sun). It names two episodes, To the Gentiles and The Feast of Pentecost. The associated Cast List credits the screenplay, production and direction to Joy Harington. This latter clue proves helpful since there is a book by the same name produced in 1961 which apparently features pictures from the production (see book cover above). I have this book on order, and will report back when I have it. I can find only one other picture from the production online, but it is a good one, of Troughton in the key role, folding his arms and looking rather mean. Does anyone know anything about this forgotten production? Does anyone remember seeing it? Does anyone have a copy? I hope to do some more investigation over the coming months and to report back. Announced today, the creation of a bold event drama retelling the last week in the life of Jesus Christ – The Passion – written by Emmy Award-winner Frank Deasy (Prime Suspect 7), a BBC Drama Production in association with HBO and Deep Indigo. Joseph Mawle (Soundproof), James Nesbitt (Murphy's Law), Paul Nicholls (Clapham Junction), Ben Daniels (State Within), Laura Fraser (Casanova), Denis Lawson (Bleak House) and David Oyelowo (Five Days) lead the cast in this unique and compelling dramatisation. Nigel Stafford-Clark (Bleak House) produces. The Passion will be stripped across Easter week on BBC One, drawing to a dramatic climax on Easter Sunday. Visually arresting and rich in colour, the story is rooted in the tangled and chaotic world in which it took place – the city of Jerusalem during Passover week. Set in the political and religious context of the time, it combines both narrative tension and thematic power to convey the extraordinary events that took place that week in a bold and distinctive way. This production places the audience at the heart of the action by telling the story from three points of view – the religious authorities, the Romans and Jesus. For the first time, all the key players are intimately characterised with Jesus (Joseph Mawle) at the centre. Full of emotion and charged with energy, beginning with Jesus's prophetic entrance through the East Gate, following him to his crucifixion and its startling aftermath. Award-winning producer Nigel Stafford-Clark says: "The Passion is a gripping, multi-stranded dramatisation of not just the most familiar but arguably the greatest story ever told. "Both truthful and simple, it gives it back to the audience in a way that will feel as fresh, contemporary and surprising as if it were happening for the first time." Jane Tranter, Controller, BBC Fiction, says: "Challenging and bold programming and scheduling that you would only find on the BBC, The Passion is an example of BBC Drama's commitment to deliver ambitious and distinctive projects. "It is a privilege to be making such a major piece of drama from the brilliant Frank Deasy, directed by Michael Offer with an amazing cast. "We are delighted to be collaborating once again with HBO, continuing our strong creative relationship which has seen us working together on many projects, most recently Five Days, Stuart: A Life Backwards and Einstein And Eddington." The Passion is produced by Nigel Stafford-Clark (Bleak House), written by Frank Deasy (Prime Suspect 7) and directed by Michael Offer (State Within). The Executive Producer is Hilary Salmon. The Passion was shot entirely in Morocco. Then news is brought that the Galileean is approaching the city on a donkey's colt, and will be entering Jerusalem through the East Gate – thus fulfilling two of the most powerful religious prophecies of the coming of the Messiah. The one who many believe will lead them to military victory or spiritual salvation. More substantively, I am happy to report that I have seen rough edits of the first two episodes and they are really excellent. I am very excited about this, having been involved with this project as a consultant for just over two years. In due course, I would like to tell the story of the project from the sidelines of my small contribution. At this stage, though, I should not be revealing any of its secrets, so my story will have to wait. Peter Firth (Spooks), Paul Hilton (True, Dare, Kiss), Lorraine Ashbourne (Jane Eyre, Playing The Field) and Penelope Wilton (Shaun Of The Dead) star in five new plays by award-winning writer Nick Warburton which tell the story of the Gospel of Luke. The story is told through the eyes of Peter, Judas Iscariot, Andrew, Mary Magdalene, Jesus's mother Mary, Caiaphas, Pilate and many other ordinary men, women and children through whose lives Jesus passes, from his birth in Bethlehem, through his ministry, to his death on the cross and resurrection. Warburton creates his dramas as the Gospel was made: by piecing together the story of Jesus's life from the memories of those who saw him. On radio, there are no beards, no sand and no sandals. Filmed versions of the Gospel story can get bogged down in these images and make the events and characters seem remote and unconnected to us. The radio format allows Warburton to imagine the private thoughts, hopes and fears of those around Jesus, making these dramas intimate, accessible and alive . . .
Read it all -- there is also news of a related programme presented by Ernie Rea, Witness - Behind Luke's Story. Minneapolis (November 13, 2007)—In the newly released Hermeneia Volume Mark: A Commentary, Professor Adela Yarbro Collins brings to bear on the text of the first Gospel the latest historical-critical perspectives, providing a full treatment of such controversial issues as the relationship of canonical Mark to the “Secret Gospel of Mark” and the text of the Gospel, including its longer endings. She situates the Gospel, with its enigmatic portrait of the misunderstood Messiah, in the context of Jewish and Greco-Roman literature of the first century. Her comments draw on her profound knowledge of apocalyptic literature as well as on the traditions of popular biography in the Greco-Roman world to illuminate the overall literary form of the Gospel. Harold W. Attridge is Dean of Yale Divinity School and Lillian Claus Professor of New Testament. His books include Hebrews in the Hermeneia series (1989, 978-0-8006-6021-5). To order Mark: A Commentary please call Fortress Press at 1-800-328-4648 or visit the Web site at www.fortresspress.com. Minneapolis (November 12, 2007)—Discussions of the meaning of Jesus’ passion are at a creative high point, in part because of popular events like Mel Gibson’s The Passion of the Christ, and Dan Brown’s The Da Vinci Code, but also because of a groundswell of interest in contemporary biblical scholarship. In Taking Up the Cross: New Testament Interpretations through Latina and Feminist Eyes, New Testament scholar Barbara E. Reid brings her critical and compassionate eye to the different ways the New Testament writings describe Jesus’ death. Here Reid pays attention to the role of women in the accounts of Jesus’ passion and observes that some of the interpretations of Jesus’ death in the New Testament open us up to life and liberation, while others have been used to perpetuate cycles of violence and victimization. She also orchestrates a chorus of women’s voices, from Mexico, Peru, Bolivia, and the United States, speaking to the countless ways that the cross has been invoked to control and diminish them, and to their rediscovery of the cross as a symbol of emancipation and dignity. Reid discusses five distinct ways of understanding Jesus’ death, and shows that each holds the potential to bring life and connection as well as the potential for oppression and harm. She moves from the biblical text to the lived experience of women in cultures where the cross has been central to the way suffering and death have been understood. A model of feminist and liberationist biblical interpretation, Taking Up the Cross reads alongside women for whom the cross of Jesus has indeed been a matter of life and death. Barbara E. Reid, O.P., is Professor of New Testament Studies at Catholic Theological Union and author of a number of books, including The Gospel According to Matthew (2005), Parables for Preachers, Year A; Year B; and Year C (1999–2001), and Choosing the Better Part? Women in the Gospel of Luke (1996). By Barbara E. Reid, O.P. To order Taking Up the Cross please call Fortress Press at 1-800-328-4648 or visit the Web site at www.fortresspress.com. . . . . Why do otherwise brilliant people give such soporific talks? First, they’re scared. The pattern is a perfectly understandable reaction to stage fright. It’s easier to hide behind the armor of a written paper, which you’ve had plenty of time to work through, than simply to talk. But second, and much more important, it’s part of academic culture — especially in the humanities. It's embedded in our language: we say we're going to "give a paper." As a euphemism for a talk, this is an oxymoron. Presentations are not articles. They are a completely different medium of communication, and they require a different set of skills. Professors often fail to recognize this, or to teach it to their graduate students. Stage fright is something everybody has to handle in their own way. But academic culture is something we can deliberately change. This short essay is an attempt to begin that process with some pointers for effective public speaking . . . . I have provided that quotation by way of taster. I must admit to finding it very refreshing to see someone independently making the case I have been trying to make for the last three years; he does it with clarity and style. I see that the article appears in a variety of places on the net where other sympathisers have uploaded it, so I'd also like to thank Paul Edwards for making it available in this way, which demonstrates the power of the net to disseminate one's writing on topics of interest to a broad range of people.